First thing I notice is the stick's uneven complexion. So much so, that there's almost a barber-pole look to it along one seam in the 2/3. Seams are also a bit uneven and on the loose side. Barely any veins and absolutely zilch insofar as potential impediments to burn. Cap is nicely affixed. Foot tobacco is a shock of reddish auburn and dirty blond highlighted; packed to a medium density sayeth mine eye. That uneven complexion is of the dark fudge espresso bean variety. No real under-tone, just more of what's up-top... very dense coloring. Over top of it is a nice even sheen resting on a bit of toothy top-leaf. Hand-feel is nicely balanced and is packed medium+ off a Charmin squeeze, with a dip down to medium in the 2/3's end. Schnozzing the shaft and the foot is an all-round dark rich tobacco with spicy soft chocolate characteristics. Texture is mainly smooth with just a hinted catch of tooth. No ridges, no lumps. I employ my Xikar cutter to cut. It cuts. Cold pull is more of the schnoz with the addition of a heavy cedar note. Tension on the draw is a good medium+ and seems to firm up the more I draw -- to a point -- than it loosens to a near medium. Chocolate sweetens as I tug. Kinda nice. Very straight forward. Very cedar aroma on toasting the foot, some accompanying of sweet roasted mixed nuts. The Djeeping is a somewhat patient affair, but ends in a very even lighting. First hot pull is again the heavy tobacco note with chocolate and spice qualities. Spices are cinnamon and nutmeg with some hint of clove. Chocolate is soft and almost chewy -- like fudge or an under-baked brownie. A peppery cedar comes in on the finish and seems medium+ in leg-length already. Second hottie is retro-haled to nice black pepper and the already noted spices upon its clearing. Draw is very chocolatey. Finish is quite cedar. A third pull is a straight-forward continuation with a sweetening of the finish and a creamy texture on the mouth-feel. Profile is a lush medium, strength is a mild+. Room-note is a densely rich tobacco laced with spiced cedar notes. Burn is a slight ribbon, but even 'nuff. Line is almost invisible. Ash is white with just the least bit of charcoal by the toasting. Some flake, loose ladder-rung growth. Packing softened considerably off of lighting. Very smooth draw delivering velvet-smooth notes. Already, the strength mounts to -medium. Flavors delineate and a compost of grape leaves lie underneath sweetly. Lots of red to purple fruits at the end of draw and laced throughout the profile. They start high-up and drop very quickly to the compost under-belly. Primary notes: chocolate darkens and is near sinful gooey; its softness is braced by a seasoning of the cedar. Red spice rack is in the lower middling. Dark fleshed nuts are mid-middling. Tobacco, black and deep, is the rest of the middling as well as the driving force. Finish is cream-textured nuances of the draw notes and medium+ leg'd. Ash clumps at well shy of an inch, before I even get my schmatta outta my pocket. Very powdery. foot-smoke is a low+ out-put. Smoke-hole fills easily. Tongue is coated with thick oils and palate is fairly crisped via cedar. Fruits pick up some tannic vibes, then notes. Nuts are mainly pecan-like. Chocolate retains its goo, and a cakey texture forms around it. Yeasty, somewhat. Black pepper is finely ground and softly delivered, entirely on the retro-hale. Red spice rack dials up a tick, but remains swell. Profile is holding at an across-the-board medium, but very robustly so. Ya know what, gentlepersons? Lettuce consider the profile a medium+ and the strength a medium. Regrown ash is same as prior, with closer ladder-rungs. Foot-smoke up-ticks a tick or two. Cedar leaps ahead of chocolate in the high-up. Coffee, dark roasted and poured black, settles into middlings. Fruits dial back a step on that new introduction. Some hardwood shavings sidle up to the cedar. A leathery thing is on my palate, particularly in the finish, which has lengthened to a somewhat chewy -long. Draw resistance is a bit more tense, but fine. Chocolate hits sooner and more intensely, but leaves sooner. Dark and rich tobacco bulges from upper middling into the top note. Very relaxing offering, this Oliva. Keeps getting richer and smoother and darker. At the end of the opening act, a wine cask note appears on the retro-hale, RH drops to the palate in a nutty manner. Room-note sharpens in a tannic sort of manner. Construction and combustion are unchanged. Profile is locked in, as well. Cap has a very black forest cake taste when dangled cold in the lips. There's a tad bit of mineral vibe there, as well -- which wraps around to the finish and builds on the tongue with some roasted salt. Compost underneath is velvet. Pace of smoke adds to the relaxed mood of this Serie O. Burn ribbons a tick more. Pack softening ceases. Black pepper is a mere sauteed hint. Ash will not hold. Smoke out-put builds. Burn goes a tick astray, but I hold off on a re-touch. Chocolate regains its stride. Strength goes up to medium+ and tannic quality leaves, but dark fruits stay and gravitates toward compost spine. Becomes a bit of prune. Very strong notes, and maturely sweetened ones at that (natch, Maduro), with some good nuance involved. Not a overly complex offering, but flavorful. Burn corrects itself. Ash flowers a tad. Leather oils build smoothly. Moisture level on the mouth-feel is a bit on the wet side, but not drooly. I keep thinking Manischewitz, which one might take as grape, but there is no small amount of cherry in that stuff... black cherry, then. It sits alongside the prune and sure, grape. Mid-point is all about this fruity playfulness. Cedar sweetens and softens. Chocolate is beautiful. Dark tobacco now dips downward into the compost. Hardwood shavings are sprinkled about. Red spice rack dials back and seems to want to seek out the chocolate, getting a bit lost in there. A great after dinner offering... unfortunately I am having it pre-lunch. Still very enjoyable. Even the head-spinning strength is kind. My sole complaint is a very flaky ash. Well, a less ribbon'd line would be grand, too. Pace slows after the mid-way. Even more calm now. Room-note is creamier and shows more chocolate. I'll be a monkey's uncle if Oliva don't never fail to impress. Coffee goes to a syrupy espresso with a lovely crema. This introduces a nice bite that keeps the dessert aspects from building up too a sickly extent. A bit less velvety now, but still very smooth and also somewhat more entertaining. Caramelized sugar flows in and let's name it a Cuban Coffee. Pecans get an almond addition and roast more. They seem to climb on the shoulders of that crema. Complexities are therein. Gotta love a complex Maduro, eh? I smack my lips and trigger a deeply dark and gooey chocolate -- as if I just ate a brownie. Although its been awhile, as I haven't done that since I was a Boy Scout. Profile is up to a -full. All C/C notes hold. Flavors have settled into lock-steps. Strength is... hold on... I'm staggering inside for a pinch of sugar. OK. Dark, oily, deep, big notes -- but still nuanced and complex. Subtle under-happenings as well. Just lovely. 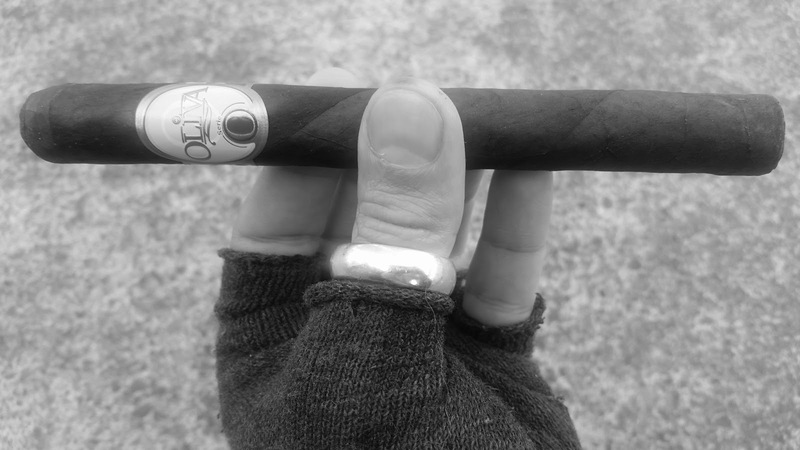 I already lament this Oliva's end. A toasty note comes further in on a black bread note -- doughy but firm. Warm. Black bread gets a bit of artisan crustiness here. Chocolate, cedar, and tobacco all marry -- not mottle -- over-top in the primary. Occasionally, the chocolate falls back to middling. Fruits are in the in-between and pinched a tick. Cuban Coffee begins to drive. That aforementioned bread, toastiness albeit softly so, permeates the middle. Leathery oils are low mid. Under-belly is a sweetly nuanced compost which seems a tick higher. Top-notes sag under their own weight. Still rather dimension'd. Red spice rack has a tick more warm cumin in its profile, mainly on the retro-hale. The new spice hints at a meatiness here. Ash is a touch less flaky and a bit of medium grey tinting sets in. Packing is quite soft. Seams loosen but hold well. Strength seems to dial back to a medium. Profile holds at -full. Heightened compost backing is really flexing now. As the band loometh nigh, we are bread-y and compost-y, veril-y. Sweetnesses begin to act as nuances within those notes. Only chocolate stands alone in a now toasted cream fashion. Smoke is cool, even, and smooth... while retaining just a hair of keep-ya-interest-oomph. Fruits fall off. Cedar comes back in high on a retro-hale and soars on the next pull. It's a creamier and sweeter wood now, seemingly borrowing from the chocolate. The Oliva Serie O ends in a creamy chocolate'd cedar note on the up-top. Bread and Cuban Coffee bulge in the middling with a smaller red spice accompaniment. Underneath is a high compost which seems to have absorbed nearly all there ever was here, withing its dark tobacco core. Very interesting delivery, that. Profile is a medium+, strength a gentlemanly medium. Burn-line is a tick raggedy again and the ash flakes slightly more. Smoke is cool, and so is I, gentlepersons. So is I. Much of the nuance/complexity is due in part to a shuffling of notes, which I'm unconvinced is intended. Very darkly and richly satiating insofar as flavors. Not an entirely clean finish, a flaky ash, and a mildly erratic burn-line detract and distract from a very pleasing and robust profile. Strength sticks with ya for a bit longer than normal, post smoking. This sampling marks the first time I employed my newest review tool in its official capacity: a Dollar Store hand-held mirror. In it, I saw that on many a pull, leaves were not evenly ignited.